Not for the first time, amnesiac Matt Sadler (Steve Garry) awakes alone in the middle of a wilderness with no recollection of the past seven days. Finding his way home he discovers a life rapidly falling apart: his wife is convinced he’s hiding an affair, the police are suspicious of his repeated disappearances and now he is plagued by terrifying nightmares when he closes his eyes. Genuinely dark and quintessentially English, The Fallow Field is a throwback to brutal horrors and thrillers of the 1970s. Capturing some of the genre’s bleak tones and threat, its twisting plot, slowly building sense of dread as well as sudden shocks and visceral scenes prompted Paul Higson at The Zone to describe it as "smart-chops horror" and "a sterling addition to the growing crop of intelligent British horror films and it deserves a great deal of attention," and by none other than John Landis as "a handsome, thrilling and strange movie." In that way those pitching or selling a movie have of trying to describe it as an unholy hybrid of two previous movies, The Fallow Filed is being sold as "Memento meets Wolf Creek set against the backdrop of English harvest time." 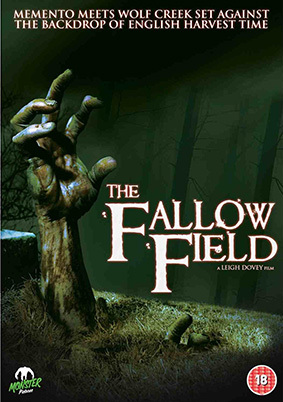 The debut feature from director Leigh Dovey and producer Colin Arnold, The Fallow Field will be released on UK DVD by Monster Pictures (whom we like a lot) on 11th March 2013 at the RRP of £13.27.